The ancient Andean people excelled in designing full frontal faces, with wide staring eyes that meet the viewer’s gaze, head-on. The best of these images are bold and clear, designed to make the image easy to understand and captivating. Even if we do not understand the message, these faces telegraph information. They are the pictorial equivalents of a highly legible font, such as Johnston’s British Railway type (1916); both are powerful communication tools designed by master artisans and understood at a glance by those able to read them. Frontal faces, whether disembodied or not, were features of Andean art from the first millennia BCE to the arrival of the Spanish in 1532. They appear in different geographic locations and artistic media, such as ceramics, stone, shell, metal and textiles. 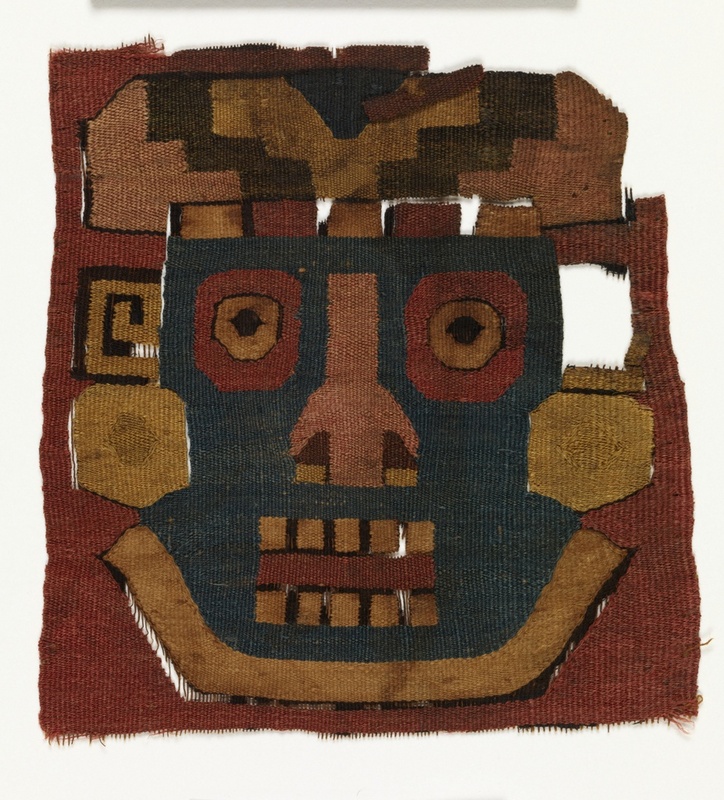 In the case of the woven example shown above, we do not know whether this face represented a heroic ancestor, supernatural being, or living elite; nevertheless the image remains a powerful proxy, likely meant to reinforce differences in status between the viewer and the being represented by the image. We can deduce the high status because this particular face wears a cap or turban with stepped design held by a chinstrap, and a pair of large earspools. Although the ancient Andeans did not develop a writing system, we know from the Spanish chroniclers that both these accessories were indicators of high status during Inca times, and the archaeological record supports this meaning for earlier Andean cultures. The image in this example, a fragment cut from a larger piece of undetermined function, was tapestry woven on vertical cotton warps with colorfully dyed camelid yarn wefts and, interestingly, a small amount of cotton weft. In a tapestry weave, the image is created simultaneously with the woven fabric when new, the flexible wefts completely covered the tightly tensioned warps. Here the woven structure and thus the image, is identical on both sides. Not every culture in ancient Peru created tapestry woven images that were perfectly finished on both sides; this technical detail seems to have first appeared in the far-south Andean region, which today encompasses parts of Peru and Bolivia. Now, the passage of time has allowed both fibers to decay. In the process, yarns lose their elasticity and their original bright hues. Where the horizontal weft has decayed, the vertical warps sometimes remain, as can be seen in the image above. In a photograph, the scale of an image is lost. This woven image is diminutive, around 4 ½” square, and all the more powerful when its size is considered. Each part of the image is built from individually shaped, geometric “blocks” of contrasting colors. This technique helps to create a scale-less monumentality. Many of the areas were first outlined by “eccentric” wefts, sometimes in contrasting colors, sometimes in the same color as the rest of the fill. Tapestry woven fabrics from the southern highlands generally feature single interlocked joins, often made with obsessive precision. Here, at the intersection of differently colored areas, there are often slits of varying lengths. Longer slits are sometimes held with an occasional single interlocked join; in other areas, every other weft pass is interlocked with the adjacent color. These technical differences, among others, are recorded by scholars to help them determine provenance, and are especially important for analyzing fabrics that find their way into public and private collections through undocumented excavations. This fragment was cataloged with a similarly sized, tapestry woven mate, seen below. Again, eccentric wefts outline many of the differently colored areas. Here a yellow lattice has its bulbous interstices filled with alternating rows of green and two shades of pink. Each pink interstice is filled with a light- or dark-colored cross, half shapes are depicted along all four sides, indicating a complete unit, top and bottom edges are cut and the wefts turn back along the vertical sides. The meaning, if any, of this pattern is unknown. Many other similarly sized, square, face and lattice pairs can be found in US and European collections. The colorways of faces, lattices, and backgrounds vary, but the dimensions are similar, suggesting standardized production. To date, only a handful have been published and more are said to exist. The exact number, if known, has not been published, and there seems to be a larger number of face squares. Scholars who have examined these fragments have noted that along the vertical sides, the wefts turn back, forming what appears to be a selvage edge. At least one scholar has suggested that these pieces may have been woven as a band or bands; however, since every published example has been trimmed into a single square, the original overall pattern as well as its original function can no longer be accurately determined. An examination of all the related pieces may help assess if the various fragments once belonged to a single fabric or not. The cultural provenance also remains undetermined. Published sources suggest a Wari affiliation. Unpublished sources have suggested both late Nasca and Coastal Wari-Tiwanaku cultures. A Carbon-14 test of several of the pieces could determine their age(s), and by analogy, possible cultural affiliation. Interestingly, on stylistic grounds alone, certain details found in this frontal face can also be seen on a variety of freestanding incised stone figures and carved architectural stone faces from the ceremonial center at Tiwanaku, near Lake Titicaca in Western Bolivia. Compare, for example the face and head gear of a small Tiwanaku stone sculpture (1979.206.833) in the collection of the Metropolitan Museum of Art. While the two faces are not identical, both have a squared upper forehead and wear a low cap with chinstrap, both have concentrically circled eyes, a flared nose and rectangular mouth, albeit without teeth. It is also interesting to note that the Met Tiwanaku stone figure wears a kilt featuring a checkerboard design of squared faces alternating with a geometric pattern. Ceremonial Figure. Bolivia; Tiwanaku. 5th-9th century. Stone. However, textiles are highly portable and design details can be easily copied and spread afar. It is not yet possible to determine if a true relationship exists between these objects. However, scholars have determined that the forms used in the stonework and architecture at Tiwanaku derive from neighboring settlements near Lake Titicaca. Perhaps there is a common ancestor that relates all these coincident design details? There are examples in the Metropolitan Museum of Art (NYC) 33.149.85a,b and 33.149.86a,b; The Textile Museum (Washington ,DC) 91.119; Detroit Institute of Arts (Michigan) 36.24 -.25; Museum Rietberg, Zürich (CH) RPB1303a-d; Abegg-Stiftung, Riggisberg (CH) 1147a-d; Krannert Museum, University of Illinois, Champaign-Urbana (IL) 67.29.168-169. Christine Giuntini is the Conservator responsible for textile and organic artifact conservation in the Department of the Arts of Africa, Oceania, and the Americas at the Metropolitan Museum of Art. Bergh, Susan E. Wari: Lords of the Ancient Andes. New York: Thames-and-Hudson and Cleveland Museum of Art, 2012. Egger, Paul, ed. Textilien aus dem alten Peru: die Sammlungen der Abegg-Stiftung und de Museums Rietberg Zürich. Reggisberg, Switzerland: Abegg-Stiftung, 2007. Sawyer, Alan R. Ancient Andean arts in the collections of the Krannert Art Museum. University of Illinois, Urbana-Champaign: The Museum, 1979. Weibel, Adele Coulin. “Fabrics from Old Peru”, in Bulletin of the Detroit Institute of Arts of the City of Detroit, vol. 16 #1 (October, 1936), pp. 13-14. Young-Sánchez, Margaret, ed. Tiwanaku: Ancestors of the Inca. Lincoln and London: Denver Art Museum and University of Nebraska Press, 2004. Excellent, detailed presentation. More by this author, please.